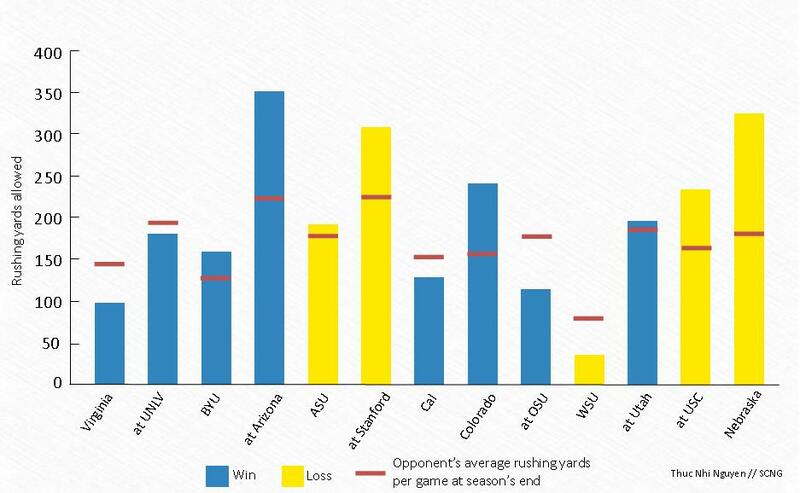 To add more context to the chart in this story from Wednesday about UCLA’s rushing defense here’s an updated chart indicating each opponent’s average rushing yards per game at season’s end. As you can see, the Bruins allowed opponents to surpass their average eight times last season, but the results were split during those games, with UCLA winning four and losing four. This entry was posted in Football and tagged spring practice by Thuc Nhi Nguyen. Bookmark the permalink. I love charts that have context like this. Thanks! Ah, the red lines help. Thanks! We’re now getting some great info on this blog. Love what you’re doing. Thanks for adding that in. It helps to see how good/bad the rushing attacks were.